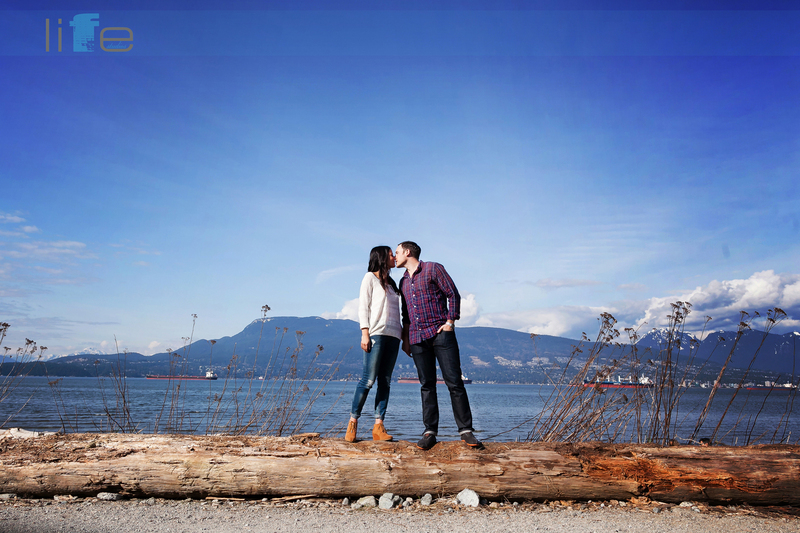 Vancouver Wedding Photography Mara and Braydin Engagement Photos – Vancouver Wedding Photographer Life Studios Inc. Upon first meeting Mara and Braydin, there is something so calm and in sync with these two. You can tell just by seeing them together that they just get each other and that they click. 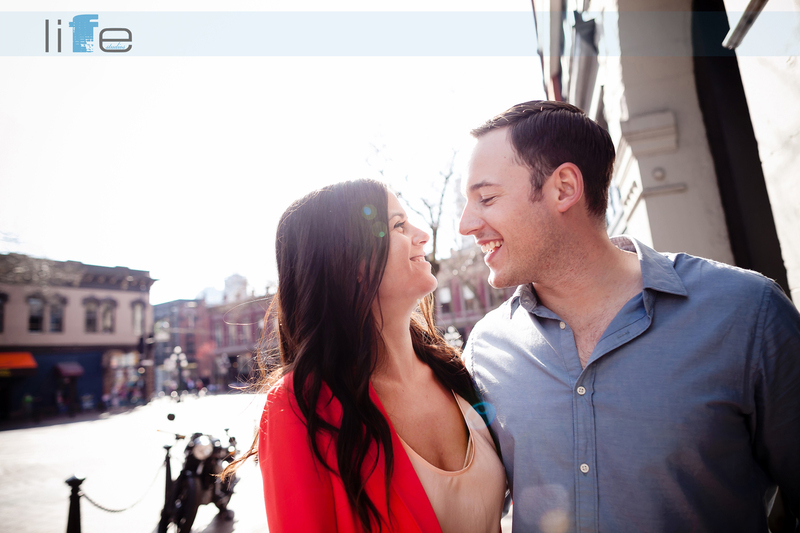 We wanted to convey that same sense of serenity and love that these two share in their engagement shoot. 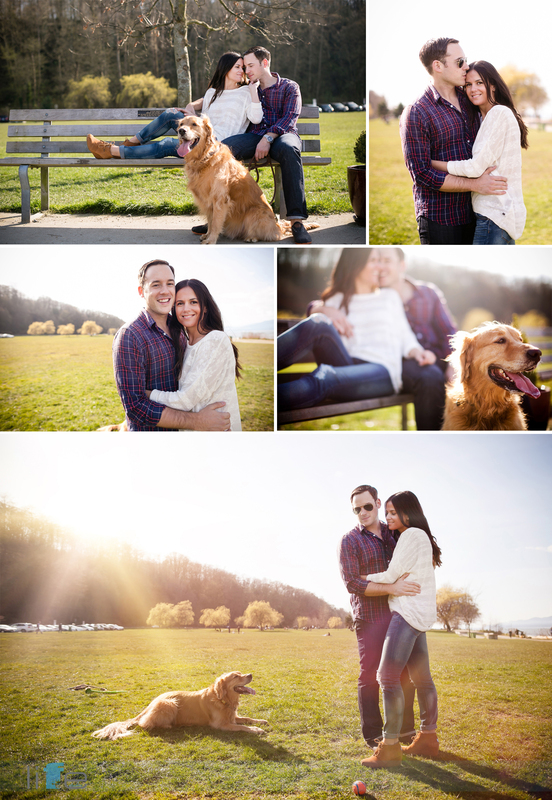 The day of the engagement shoot dawned bright and beautiful, the sky so blue and the gorgeous mountains rising majestically and backlit by the sun! Mara’s and Braydin’s adorable dog tagged along for the photos and he radiated the same calm and happiness that is abundant in Mara’s and Braydin’s relationship. Pets are such a source of joy and it was clear how loved their dog is and how large a part he plays in their life together. 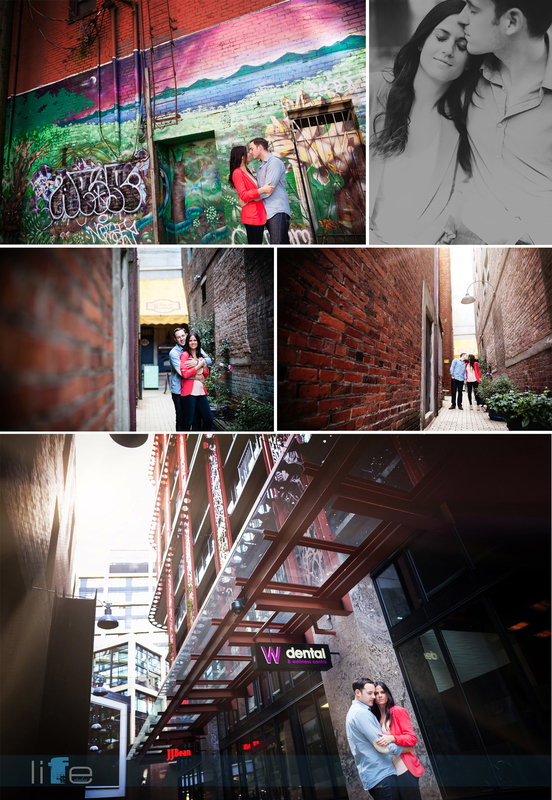 On such a beautiful day we wanted to capture the natural beauty of Vancouver and also wanted a variety of different shots. We started near the sparkling ocean and then found the neatest graffiti wall in the city! Gastown was next on our list and we absolutely love the amazing architectural details of historic Gastown and the red brick walls that grace the streets there. We love the play of the shadows in the sun dappled streets and shot some playful pictures using those same shadows. We stopped by Salt Tasting Room in Blood Alley to take advantage of their unique ambience inside. 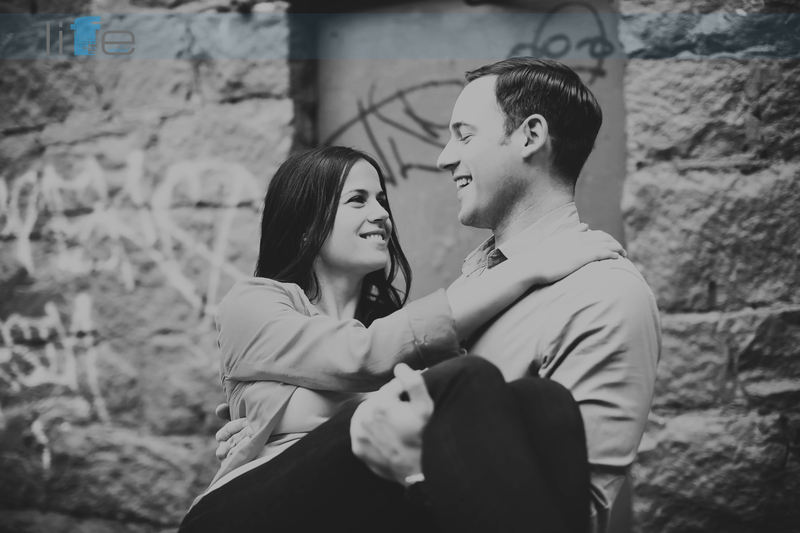 Despite Blood Alley’s name, it provides the perfect backdrop for gorgeous photos and we loved the black and white photos of Mara and Braydin. Their calm and grace is perfectly showcased in black and white photos – the stillness of the absence of colour reflects their calm happiness. 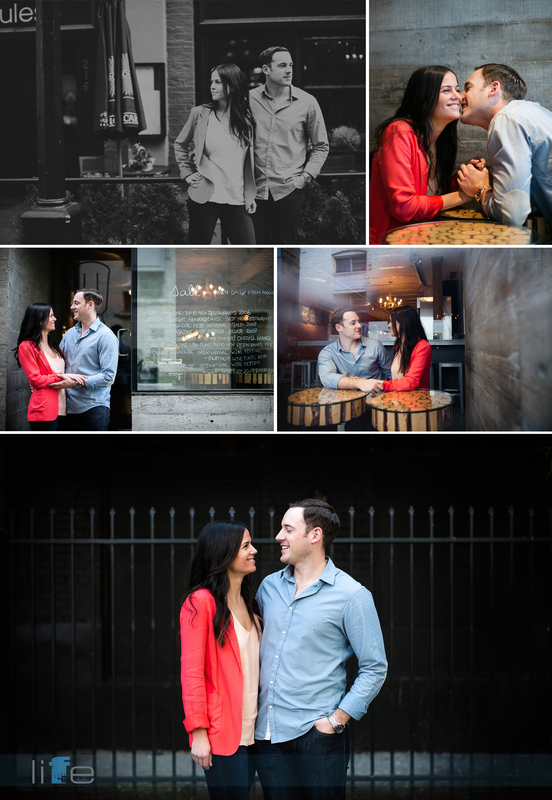 We absolutely cannot wait to capture Mara and Braydin’s wedding in photos as well as shoot their wedding trailer! 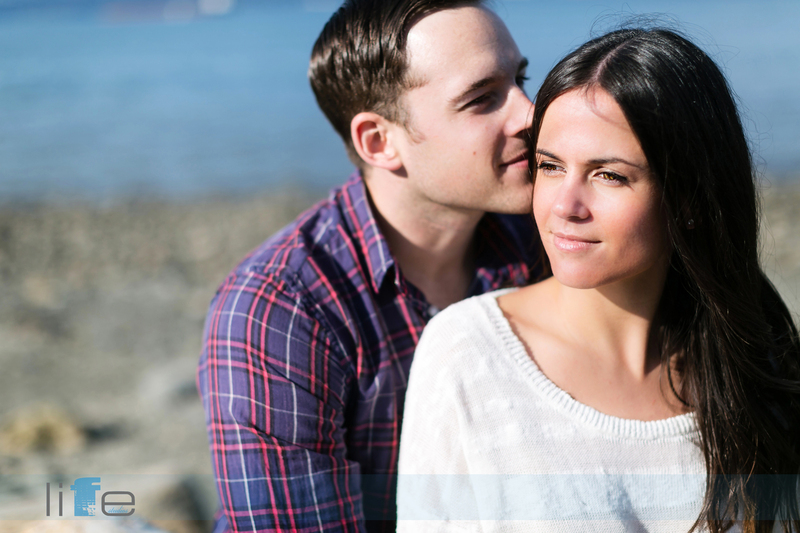 We hope you enjoy the Vancouver Wedding Photography Mara and Braydin Engagement Photos!